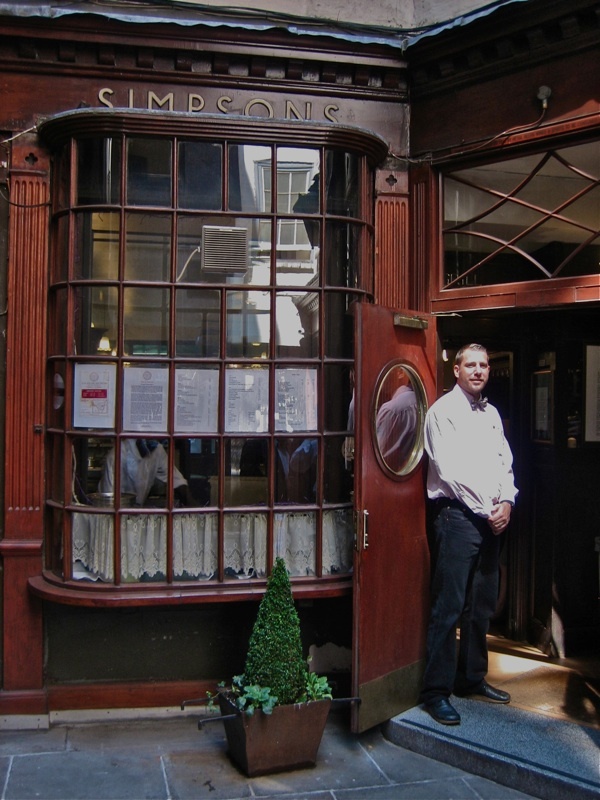 Occasionally I make forays into the City of London to visit some of my favourite old dining places there, and Simpsons Chop House – in a narrow courtyard off Cornhill since 1757 - is one of the few establishments remaining today where the atmosphere of previous centuries still lingers. 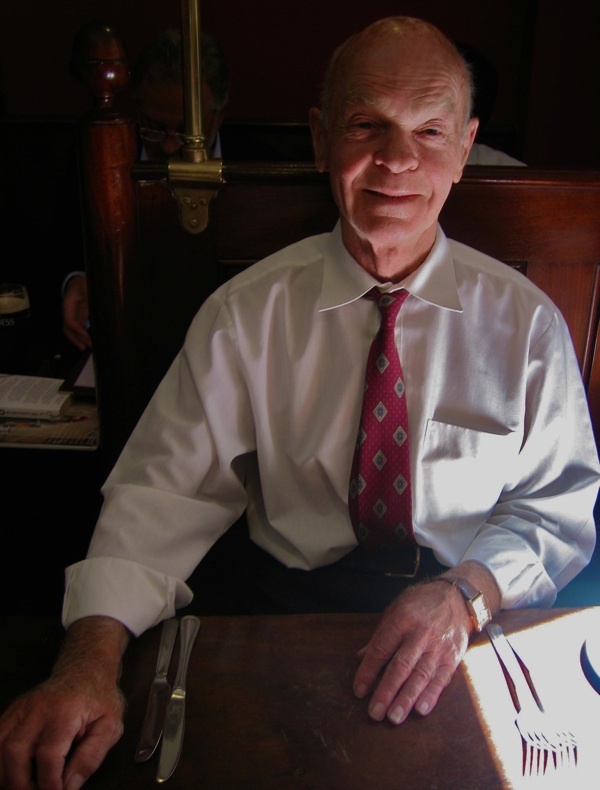 Thomas Simpson opened his “Fish Ordinary Restaurant” in 1723 in Bell Alley, Billingsgate, serving meals to fish porters, before moving to the current site in Ball Court, serving the City gents who have been the customers ever since. 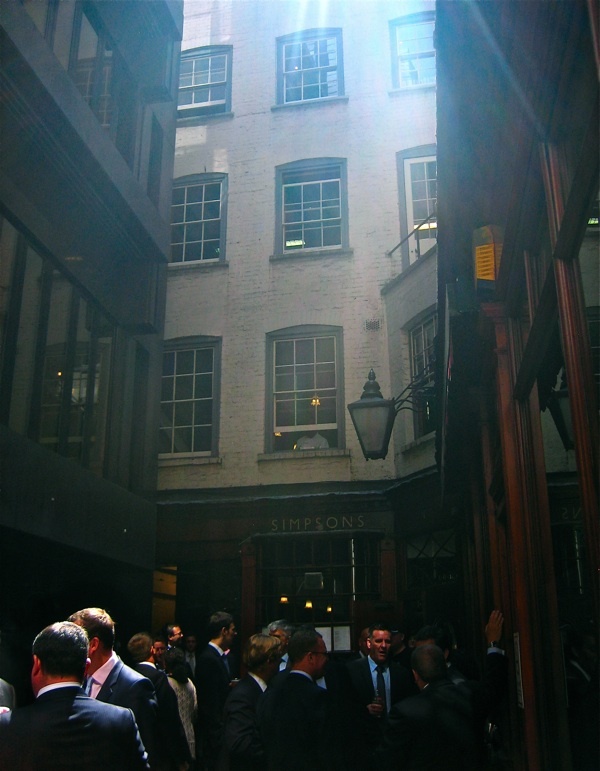 Once you pass through the shadowy passage tapering from Cornhill and emerge into the sunlight descending upon Ball Court, you feel transported into a different era, as if you might catch a glimpse of Charles Dickens and William Thackeray arriving for one of their customary lunches from the office of the Cornhill Magazine next door. Ahead of you are the two seventeenth century dwellings combined by Thomas Simpson, where a menu unchanged in two hundred and fifty years is still served upon each of the three floors, in rooms that are domestic in scale, linked by the narrow staircases of a private house. 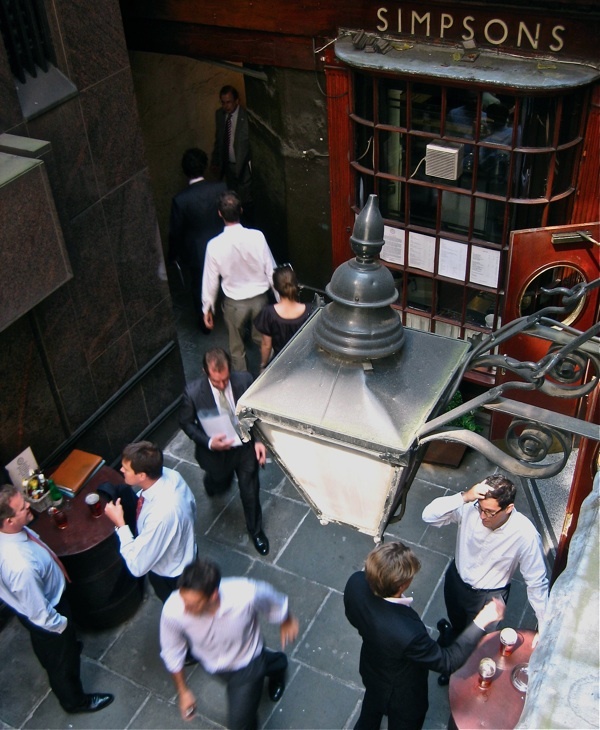 The lunchtime rush comes late, around one, which makes midday the ideal time to arrive – permitting the opportunity to climb the stairs and explore before the City gents arrive to claim their territory with high spirits worthy of schoolboys, and, most importantly, it affords a chance to introduce yourself to the noble ladies of Simpsons, who gather in the grill room on the ground floor from around eleven thirty for a light snack and a lively chat to brace themselves before meeting their admirers. These fine waitresses preside with such regal authority and character, they welcome customers as if they were old friends come to pay court at their personal salon or boudoir. And it is only appropriate that it should be so, since Simpsons was the first establishment to employ waitresses at the beginning of the twentieth century, even though women were not admitted as diners until 1916 – which licences the current females, making up for more than two centuries of lost time. “Midday was the bankers, one o’clock was the insurance people from Lloyds and two o’clock was the metal exchange brokers, and then they’d all mix up,” recalled Jean, waving her hands in a gesture of crazed hilarity to communicate the innumerable long afternoons of merrymaking she has seen here, in the days when banks allowed their staff to drink at lunchtime. Let them tell you tales of the old days when the chops were grilled on an ancient contraption which set the chimney on fire with such regularity that patrons would simply take up their lunch plates and copies of the Financial Times, and step out into the courtyard until the fire brigade appeared. Down in the cellar bar, the customers had not begun to arrive yet and, since we were alone, Jean took this discreet opportunity to bring out her calendar from under the counter, featuring all the staff in their birthday suits. 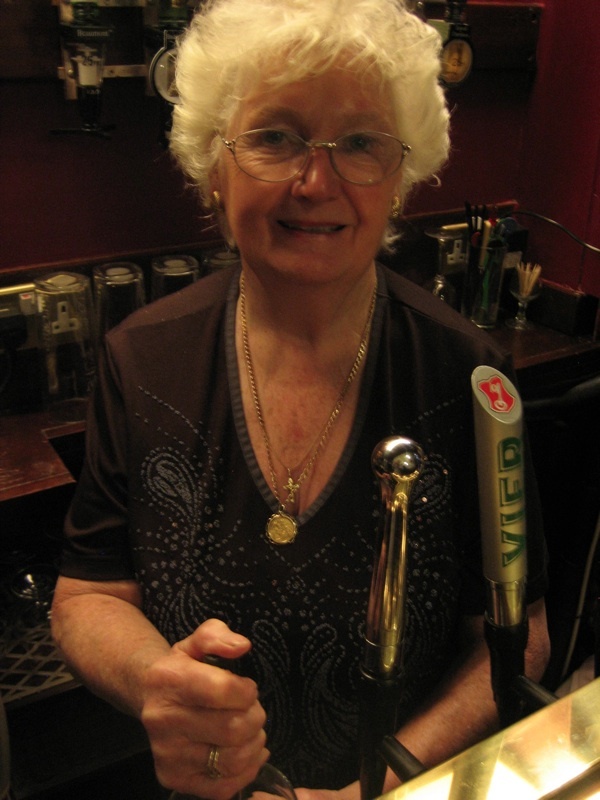 My eyes popped at the impressive pairs of stiltons and jugs of ale placed strategically in these images, while Jean confided that she had been diagnosed with breast cancer in 2007 at the age of fifty-seven and that Clive Ward the current manager had lost his wife to cancer. Consequently, the staff got together and decided, as an act of solidarity, to bare all for this calendar which sold out within six weeks to their customers, raising more than ten thousand pounds for charity. 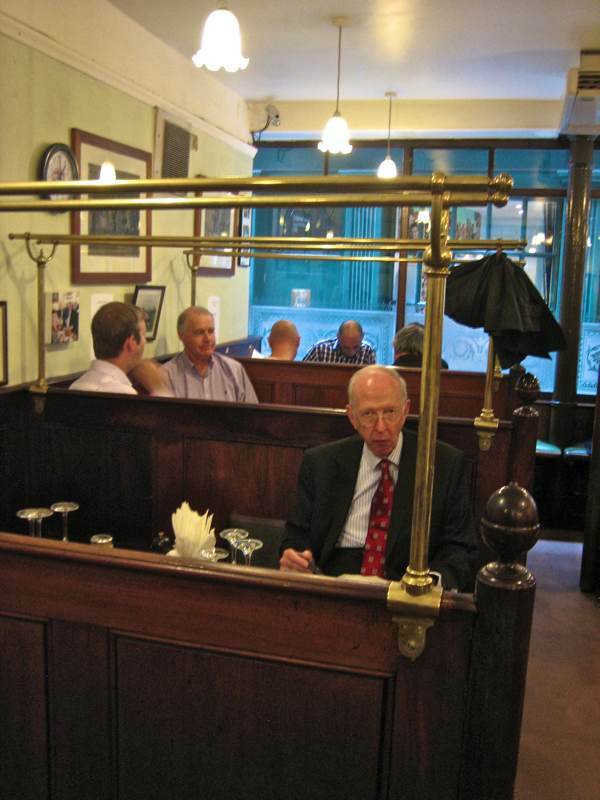 It was indicative of the unique sense of community that exists at Simpsons chop house, where diners return, even long after they have retired, to maintain friendships with those they have known all their working lives. 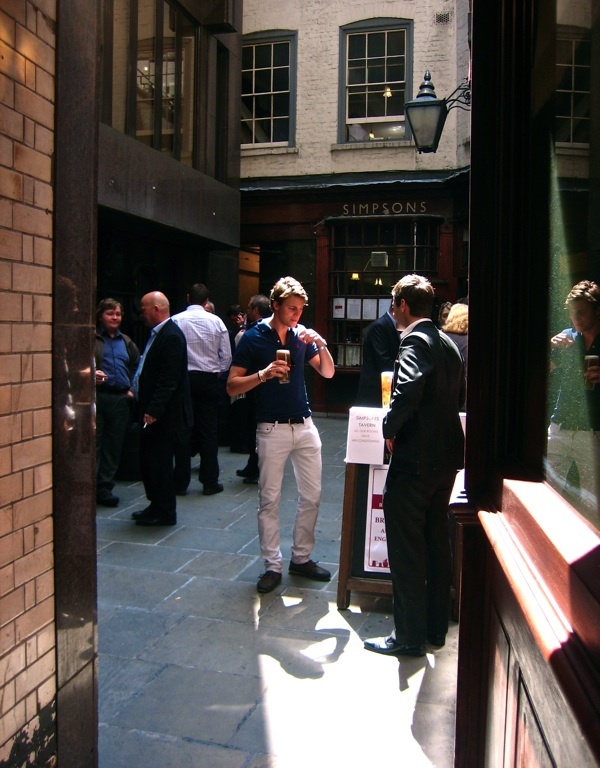 Awaiting the lunchtime rush at Simpsons, the oldest tavern in the City of London. 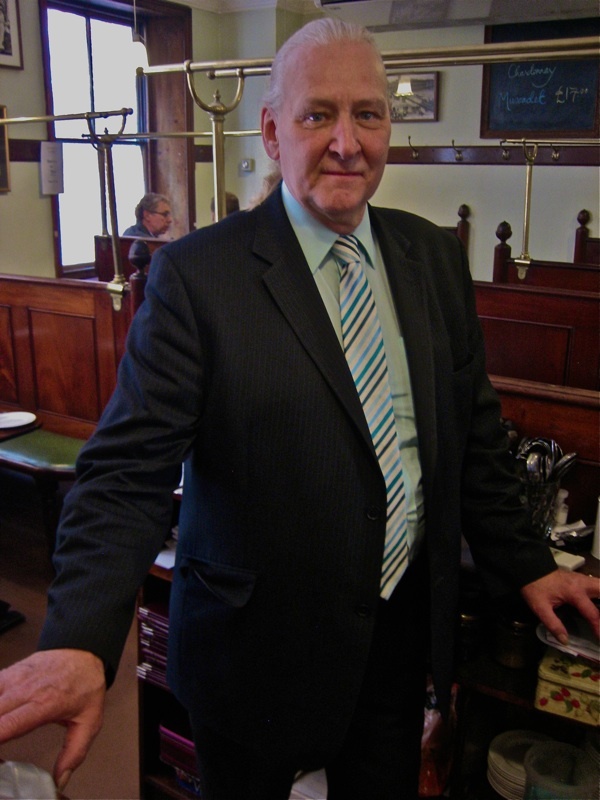 Jimmy Morgan, manager since 1978, cycles ten miles from Eltham to Cornhill and back. 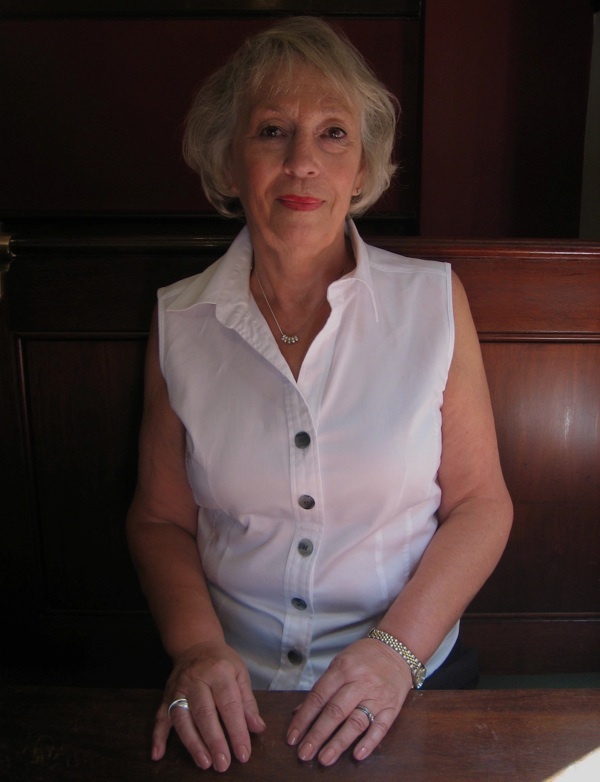 Jean Churcher, Queen of the basement bar. Maureen Thompson, Queen of the Grill Room. The brass rails were installed for the top hats of the gentlemen of the stock exchange and the bowler hats worn by the brokers. Emerge into the sunlight descending upon Ball Court and you feel transported into a different era. Kiri shows off her stiltons in February. Sheila’s got a delicious pair of starters for October. 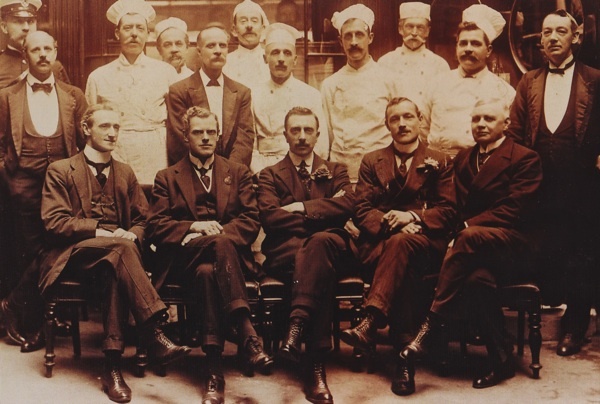 The staff of Simpsons in 1922. Why am I stuck in Tucson when I might be having a lovely lunch at Simpsons…? I visited Simpsons at Cornhill several times in the 1970′s from Australia and I am coming back again probably in September so I will certainly be coming for lunch. 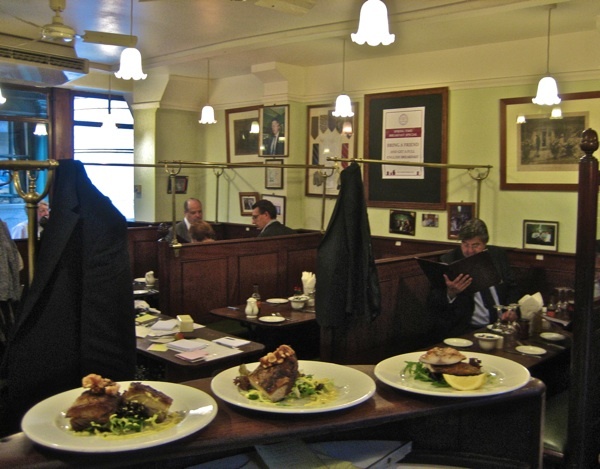 I absolutely was charmed and enchanted by the place, the history, the staff, the food and the customers. I can’t wait to visit again so see you soon. A wonderful, informative article,can find little on SIMPSONS online,past history,that is; it was bombed out in world war two. My father inlaw ran Simpsons for many years just before it closed for the redecorations and employed Jimmy. It is so lovely it has not changed and yes, all the girls are lovely! 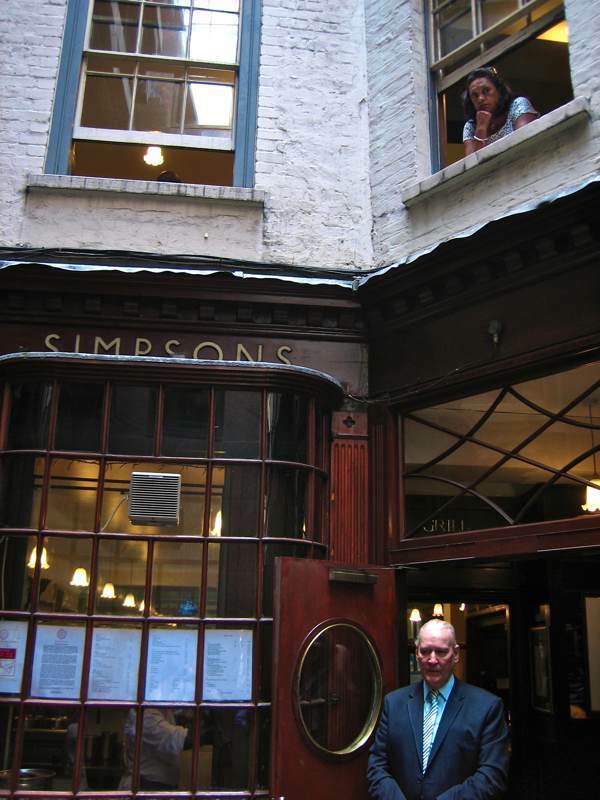 Love the place, my Grandfather and Great Uncle used to eat at Simpsons in the 50′s, 60′s & 70′s….. Since 2001 to the present day (I am having breakfast there tomorrow!!) I am eating and entertaining clients there….following a splendid tradition. Nice to know that somewhere folk can be completely indulgent without guilt! Full marks from Melbourne, Australia.